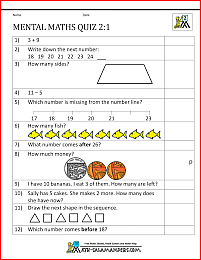 Welcome to the Math Salamanders Year 2 Printable Mental Maths Worksheets. Here you will find a wide range of Mental Maths Worksheets aimed at Year 2 children which will help your child to learn number facts and practise their number skills. Our selection of mental maths worksheets is a great way of practising your number and maths skills. The sheets can be used in a variety of ways, as a test or revision practise, or as part of a weekly quiz to help reinforce skills. They can also be used as an oral and mental starter to a lesson to get brains working! One of the best ways to use these sheets is to get children to work in pairs, discussing the questions as they work through them. The questions have been designed to practise a range of maths skills from number to geometry and measurement facts, including using time and money. The quizzes are in order of difficulty with the questions getting slightly harder in each quiz. 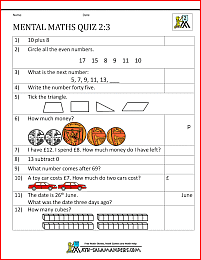 Our Year 2 Mental Math Worksheets contain a wide range of different questions and math skills. Each sheet contains 12 questions, and is provided with an answer sheet. The level of difficulty gets harder as you progress through the sheets. time questions, including date and calendar questions. Looking for some harder Mental Math Worksheets? The worksheets in this section have been designed for children at a Year 3 level. The sheets follow the same format as the ones on this page, but are at a more advanced level. If you are looking for some online practise of mental maths Year 2 facts, then we have several practise zones where you can test your knowledge of a range of maths facts and print out your results online. There are certificates to win, and instant feedback on your progress. Here you will find a range of free printable First Grade Math games at a level suitable for Year 2 children. All children like to play Math games, and you will find a good range of Math Games here for your child to play and enjoy. 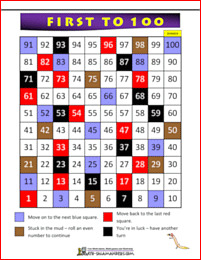 The following games involve different Year 2 Math activities which you and your child can enjoy together. 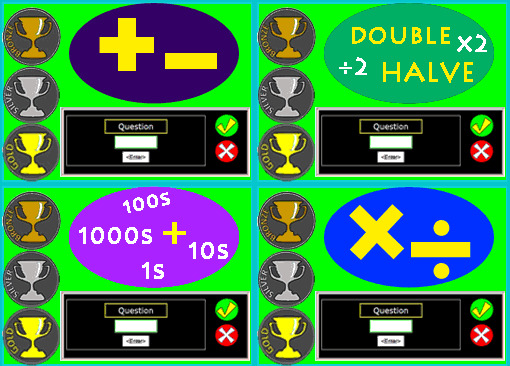 Looking for some cool online maths games to play at a Year 2 level? Try the Primary games website where you will find a bank full of different games to play! Using the link below will open the primary games website in a new browser window.